With 60 votes needed to proceed, the vote on the Pain-Capable Unborn Children Protection Act was 52-42. That means the bill will not advance even though a majority of the Senate voted FOR the bill. Unfortunately, it was a group of pro-abortion Democrats who couldn’t see their way to recognizing what all but seven countries in the world have acknowledged: that it is morally wrong to inflict pain on an innocent, vulnerable human being. And take a look at the list that accompanies this story. 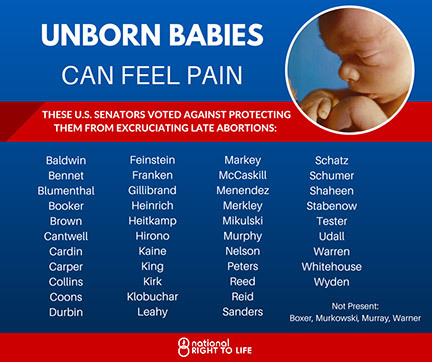 Yep, there are the names of our two senators from New York, Chuck Schumer and Kirsten Gillibrand — among the 42 senators who voted against protecting babies from excruciating abortions. Read the story Majority of U.S. Senate votes to advance Pain-Capable Child Protection Act, but Democrats block consideration from the National Right to Life News.